Ankara will offer a “final” deal to the European Union on visa-free travel after Turkey’s constitutional referendum just a few days away, Foreign Minister Mevlut Cavusoglu said Thursday. “We will make our final offer to the EU after April 16,” Cavusoglu said in the Mediterranean province of Antalya. “We will then decide how to proceed and make our decisions publicly known. We need to get visa-free travel. This is part of the latest migrant deal we signed”. Following the first anniversary of the March 2016 deal between the EU and Turkey over refugees, a number of key European commitments remain unfulfilled, including granting Turkish citizens the right to visa-free travel in Europe’s Schengen zone. According to a European Commission report released last month, to get the visa waiver Ankara needs to fulfill seven outstanding criteria out of a total of 72, including “revising legislation and practices on terrorism in line with European standards”. Ankara has ruled out any such revision. The March 2016 deal also envisaged a “one-for-one” formula under which failed asylum-seekers in Europe would be returned to Turkey, while Syrian refugees would be resettled in EU states under a quota system. But a report released by the European Commission this week found the numbers promised in the deal have not been realized. According to the commission’s 11th Relocation and Resettlement Report, the total number of relocations stands at 16,340 since last March, far below the 160,000 goal. 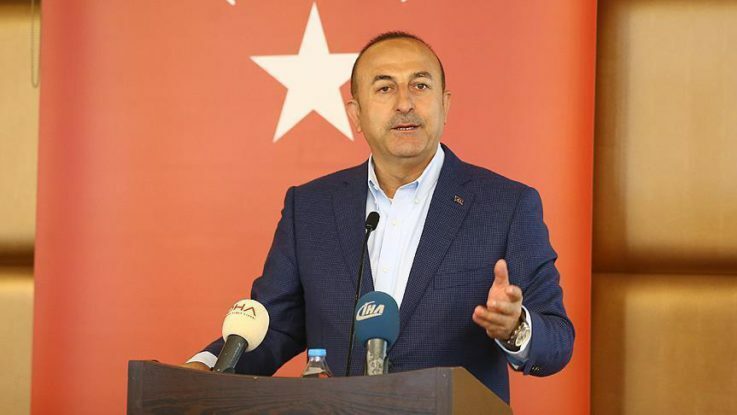 Cavusoglu also said that there have been some “obstacles” to agricultural trade with Russia, adding that Deputy Prime Minister Mehmet Simsek will meet with Russian officials at their invitation. “A delegation chaired by Deputy PM Simsek will head to Moscow next week. We will sit and talk with our counterparts and hopefully reach a deal that will remove all the obstacles,” Cavusoglu said. He said Turkey imports some $3 billion in agricultural goods from Russia annually. “Our companies buy many goods like corn and sunflower. They enrich these goods and export them,” he added. Trade and other barriers have been falling since Ankara and Moscow mended fences over the 2015 downing of a Russian fighter jet along the Syrian border after it violated Turkish airspace.